It’s easy to believe right now that this is the tropics. It’s hot, rain is falling in sheets and life is lived to the constant whine of mosquitoes. Scientists have told us that climate change means more rain and hotter temperatures in the north, and data is backing them up. A report released this week by the National Institute for Water and Atmospheric Research (Niwa) shows that March was, for many of us, one of the hottest and wettest on record. It was the month of the “Tasman Tempest”, in which parts of the upper North Island received three times the usual monthly rainfall in just five days. In Whangaparaoa, they got an incredible 354mm – nearly five times the monthly average. 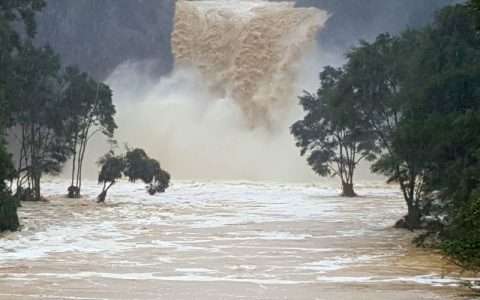 The rain caused havoc across Northland, Auckland and Coromandel, with people and animals having to be rescued from floods. Schools were closed, property was destroyed and the Auckland city water supply was contaminated with sediment. It was hot, too. Niwa’s records show that temperatures in most of the North Island, and the north and west of the South Island, were above normal, with average monthly temperatures up 2.8deg in Taupo, and Auckland, Hamilton and Tauranga all recording mean temperatures between 0.8deg and 1.3deg above normal. And now it’s raining again, and there are more floods and evacuations, and the scientists are telling us that this is what we should expect with climate change. The weather isn’t the only bad sign we’ve had this week. 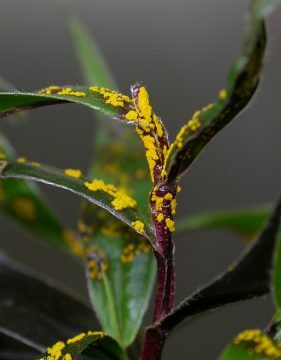 Yesterday, the Ministry of Primary Industries confirmed that myrtle rust (Puccinia psidii) is on Raoul Island in the Kermadec group, north of New Zealand. Myrtle rust comes from South America and has spread to South Africa, Hawaii, Asia and Australia, where it has wiped out several native tree species. In New Zealand, it’s a threat to our beloved rata and pohutukawa (imagine Christmas without it), kanuka and manuka (and therefore our $27.4 million export honey industry) and commercial crops like feijoas and guavas. Myrtle rust is a fungus spread by wind-born spores, and requires warmth and moisture – the kind of conditions we are only going to get more of if we keep pumping greenhouse gases into the atmosphere. As far as we know, human “civilisation” has been around for about 10,000 years. It matches the Holocene, an epoch of warm and stable climate that has allowed us to farm, build cities and develop culture. For most of that time, the concentration of carbon dioxide in the atmosphere has been about 280 parts-per-million, and that’s what has helped to keep our climate stable. 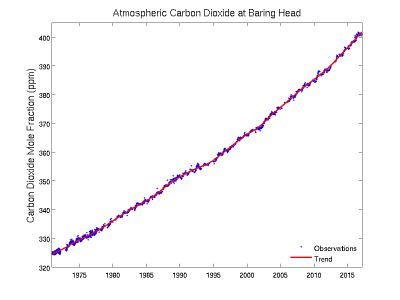 But since the Industrial Revolution, when humans started burning fossil fuels, the carbon dioxide concentration has been rising, and has now been recorded by New Zealand scientists at 401ppm at the Baring Head in Wellington. The last time it was that high was 15 million years ago, when average temperatures around the world were 3deg to 6deg warmer. But there’s more: another report out this week, from scientists at the University of Southhampton, shows that if we keep on burning fossil fuels at the rate we’re going, by 2400, atmospheric carbon dioxide concentration is likely to be at an incredible 2000ppm – higher than at any time since the dinosaurs appeared 240 million years ago. So what can we do, other than buy a set of good wet-weather gear and put our houses up on poles? The first and most important thing is to slash greenhouse gas emissions. There is no alternative, and it has to be done quickly. Prevention is better than cure. But given we’re already locked in to a certain level of global warming, the second most important thing we can do is look after nature. For example, healthy natural ecosystems will help to protect us from drought and flood. Plants not only taken carbon dioxide out of the atmosphere and store it, they also help to regulate the hydrological cycle, by slowing down the passage of water as it falls as rain, and creating soils rich in humus that hold water and allow it to filter slowly out towards our rivers and the sea. So by protecting and restoring our native forests through pest control, we can reduce much of the impact of climate change on ourselves and on nature. The principle applies to the seashore and in the cities, too. Mangroves and dunes – both important habitats for native birds, insects and other creatures – will also help to protect our homes, businesses and farms from the worst effects of wild storms and rising sea-levels. And filling our cities with trees and permeable ground cover will not only allow native species to move in response to the changing climate, but will also keep our cities cooler and reduce flooding. There is now no doubt that climate change is upon us. It threatens us, in New Zealand, and our unique natural world, and what we do now matters. This year, Forest & Bird will be releasing reports on some of the impacts of climate change on nature, and is developing programmes to help everyday Kiwis to do their bit to make our natural places resilient to the changing climate. Because protecting nature gives us the best shot at protecting ourselves. Adelia Hallett has contributed 7 entries to our website, so far. View entries by Adelia Hallett. Do wonder if the planners have started to bring in planting gangs to stabilize the slips round the the water catchment area for Aucklands water supply? I’ve just read this piece by Adelia hallett, very good, well written and quite a lot in a short length. Thanks for making the effort to write it, it all helps us keep our focus to keep doing what we can. Thanks Adelia. Forest & Bird Gisborne Branch.